TEXAS: Lt. Governor Vows To Block "Disgraceful" Wendy Davis Filibuster Movie From Filming In Senate Chamber - Joe.My.God. Texas Lt. Gov. 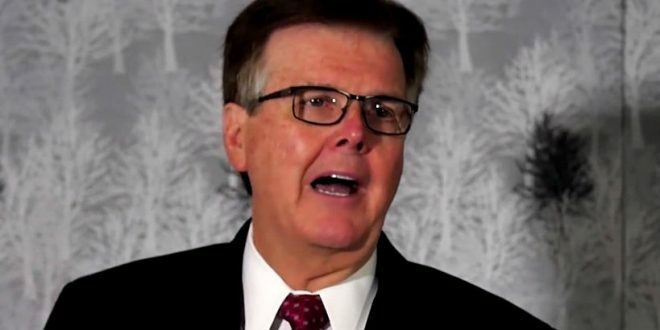 Dan Patrick on Thursday said that, if he can help it, the planned movie on former state Sen. Wendy Davis’ 2013 filibuster won’t be shot in the Texas Senate chamber. “If I have anything to do with that, I’m not going to let them use the Senate chamber to shoot because they have already disgraced it once. I’m not going to let them do it again,” Patrick, who leads the Senate, said in a speech to the conservative Texas Public Policy Foundation think tank. The movie, “Let Her Speak,” will star Sandra Bullock as Davis, whose nearly 13-hour filibuster temporarily prevented a GOP bill restricting access to abortions from becoming law. The moment launched Davis into the national spotlight and led to her running for governor in 2014, a race she lost by 20 percentage points to Gov. Greg Abbott.